House Minority Leader Nancy Pelosi of California escorts Democratic presidential candidate Hillary Clinton after a House Democratic caucus meeting on Capitol Hill in Washington, June 22, 2016. Democratic Party unity was the target when Hillary Clinton, the party's presumptive nominee for the presidential election, met with fellow Democrats on Capitol Hill. But some rank-and-file Democrats who campaigned against Clinton are still skeptical about voting for her in the November general election, and that could put the party's united front at risk. Mackenzie Hiltz, a 20-year-old woman from Vermont, home state of Senator Bernie Sanders, says talk of party unity will not affect her choice when it comes time to vote. Asked whether she will vote for Clinton, as former Sanders supporters are being urged to do, Hiltz was firm: "Absolutely not. I truly believe she is in it [politics] for the money, and I don’t care if she gets the nomination." Hiltz said she feels Clinton has changed her positions on key issues over the years, and does not have the same passionate concern for ordinary Americans' problems that Sanders displayed. Among Sanders supporters overall, Hiltz is not alone in her beliefs. A Bloomberg Politics survey this month of likely general-election voters said 45 percent of those who have supported Sanders do not intend to vote for Clinton, and nearly half of that group told pollsters they will vote instead for Republican Donald Trump. Congressman James Clyburn, who was in the group of Democrats who met with Clinton, said, “That is a problem for the party." Sanders, who was not at Wednesday's meeting, appeared to be coming to terms with his political situation following months of primary-election battles with Clinton across the country. “It doesn't appear that I'm going to be the nominee," Sander told an interviewer (for the cable television network C-SPAN), "so I'm not going to be determining the scope of the convention." 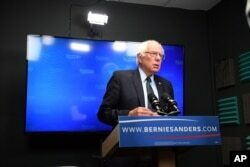 Democratic presidential candidate Bernie Sanders prepares to speak for a video to supporters at Polaris Mediaworks in Burlington, Vermont, June 16, 2016. He was referring to the convention platform - the formal statement of a U.S. political party's principles and goals, presented during the national meeting in each presidential election year. Congressman Elijah Cummings told reporters ideas for the platform were not specifically discussed with Clinton, but he predicted a final draft would be completed this weekend. “We’re trying to meld the positions of Clinton and Bernie Sanders - and by the way, that’s coming along very good so far,” Cummings said. Sanders' faithful hope the main economic message the senator stressed throughout his campaign will live on: ending corporations' excessive influence on government, and bringing the country's big banks under control - even breaking them up, if necessary. But for die-hard supporters like Mackenzie Hiltz, even a move by Clinton to adopt the Sanders program might not be enough. “I just don’t believe that she’ll make use of Bernie Sanders' ideas and follow through,” Hiltz said. Democratic presidential candidate Hillary Clinton gestures as she speaks during a rally in Raleigh, N.C., June 22, 2016. House Democrats said their meeting with Clinton took place in a “calm, relaxed” atmosphere. The second-ranking Democrat in the House, Steny Hoyer, said there was "unity, enthusiasm and confidence in our candidate." He forecast there would be a "stark contrast" on display when Trump meets with House Republicans in about two weeks. The meeting is currently scheduled for July 7. 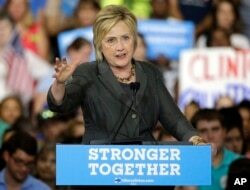 Clinton told the Democrats she plans a 50-state election strategy, aiming to win back control of both chambers of Congress from the Republicans, who have wielded majority control since the last presidential vote in 2008. In Vermont, meanwhile, Hiltz says she has been constantly active on social media, talking to other young Sanders supporters about their opposition to Clinton, and how that could swing support to Trump. “Beating Donald Trump is a huge concern of mine,” says Hiltz. Although she maintains she will not vote for Clinton, she also says, “I do think we need to get as many people behind the Democratic Party as we can,” and she does not denounce Sanders supporters who switch to Clinton's side. 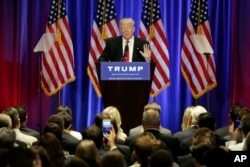 Republican presidential candidate Donald Trump speaks at the Trump Soho Hotel in New York, June 22, 2016. Congressman Keith Ellison of Minnesota, one of nine House Democrats who have endorsed Sanders' candidacy, declined to say if he was switching his support as he left Wednesday's meeting with the former secretary of state. The tough decisions many voters have to make in the months ahead could have an impact in the so-called "battleground states" - those parts of the United States where either the Democratic or Republican candidate could come out ahead, and where that outcome could affect state contests as well. Congresswoman Joyce Beatty of Ohio, one of those battleground states, is hopeful, even confident, that the choice between Clinton and Trump will be clear.